If you have not hit the newstand and buy this week The Economist magazine, you must do so. It is quite interesting to see the neo-liberal economic magazine beginning to admit their own malfunction ideology in economic matters. Of course, I myself and my mum are avid readers of The Economist since I'm in the 2nd year of my undergraduate years but we do not buy every arguments from those neo-liberals in plain manner. Thanks to my fellow comrades from Consumer Association of Penang (CAP), Friends of the Earth Malaysia (SAM), Citizen International (CI) and Third World Network (TWN), I learn to be more realisitic and criticial in understanding economic issues, especially the one being foddered by the capitalistic media. Since my first year of studying in UTP, I have specially reserved my time for intellectual activism activities that focus on economy. I personally took International Business and Economic subject when I was in the first and second year of studies just to understand the reality that all of us are in currently. It was fun and I met a lot of interesting people along the way not to mention tonnes of books that had served my intellectual appetite well. Modern economy at first to me was about a battle between Marxism and Capitalism. As you have already known earlier, I was inclined to Marxist view especially the one being espoused by The New Left and Frankfurt School intellectuals. My framework of analysis before was merely in existential aspect of the issues, focusing on macro without ever thinking to penetrate deeper than what my naked eyes could see. Well I guess, that is how modern economics have influenced our paradigm subconsiously. Poverty of metaphysics, I would say. It all started to change when I encounter Attasian framework of thoughts. I begin to understand the modern economy not just in its empirical sense but I also keep penetrating the rabbit holes of economic historicism with a bigger perspective in mind - to understand economy as a kind of civilizational discourse. 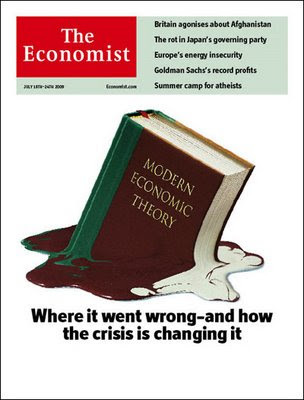 And I believe, the discourse that appears in this week issue of The Economist is trying to do the same albeit in apologetic manner towards the Modern Economic school of thought (as well Western centirc in nature). As facts are still facts, you can never hide them thus the dirty little secret of its failures still look fresh and sound to every rational mind. I tried to translate the main piece of this issue but to no avail I could not do so as the article is so complex not just in its linguistic nature as well as the substance itself. Alas, do not give up. This weekend, I have been invited by Economics Student Leaders Council (ECONS) Malaysia to deliver short talk and discussion entitled " Wujudkah Ekonomi Islam?" ( Is Islamic Economic ever exist?). The details of the event can be reached here. I do not expect a technical discussion but more on the various dimensions of the notion of 'Islam' and 'Economy' and its integrative effect from those two big concepts. Of course Islamization will be touched upon but more importantly, I hope this event will give a new lease of life onto the economic discourse among mahasiswa. Salam geng...Topik tu best naper bahasa org putih plak..terjemahkan dlm b.melayu leh tak!!! Sori ar gua skolah tak abis...mak srh skolah gua jd pelari skolah..Eee leh ar bro..Peace Malaysia..